Just a short post, but the tomatoes this year have been very interesting and very very nice. At the Horizon Centre therapy garden we have got eight different tomatoes growing in the two glasshouses. All of them are different varieties. A couple we have grown before, ‘Sungold’ being one of them. 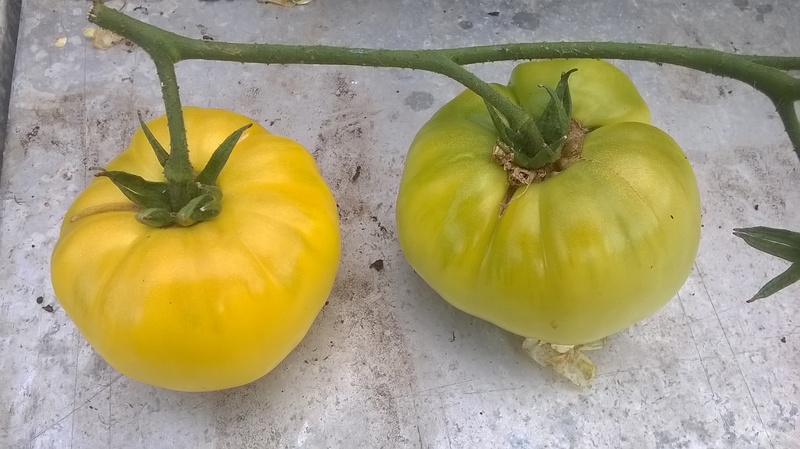 If you have never grown ‘Sungold’ and you like sweet cherry tomatoes this is the one for you. It is the sweetest I have ever grown and tasted. I can’t remember coming across it at all until a few years ago but all the major seed suppliers now sell it. 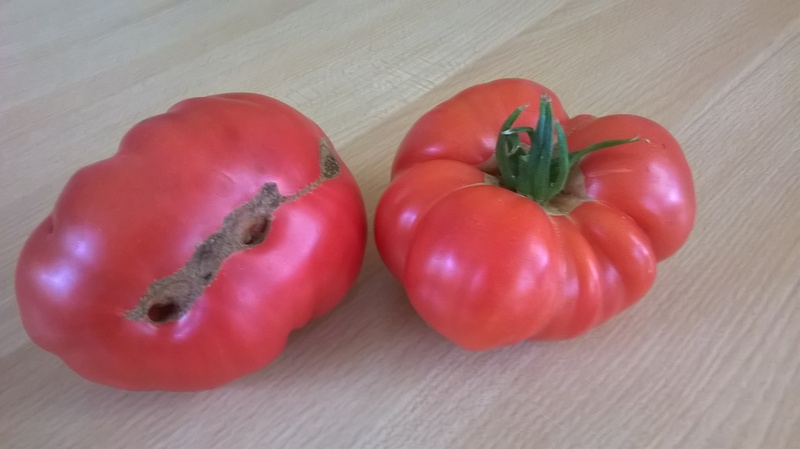 It should be noted that it is not a Heirloom variety (which I do appreciate does not fit in with the post title, but while I was here I thought I should mention it). The main purpose of this post was to inform you all of my new favourite tomato. I am not a fan of the ubiquitous cherry red in boxed salads, in fact, I can’t say that I like them at all raw. Last year, in my home garden I grew a few of the beefsteak varieties. This was mainly because I brought a few seeds back with me from America and Canada and a lot of the ones I saw that I had not seen before were of the beefsteak variety, such as ‘Great White’, ‘Rainbow’s End’ and ‘Mortgage Lifter’. 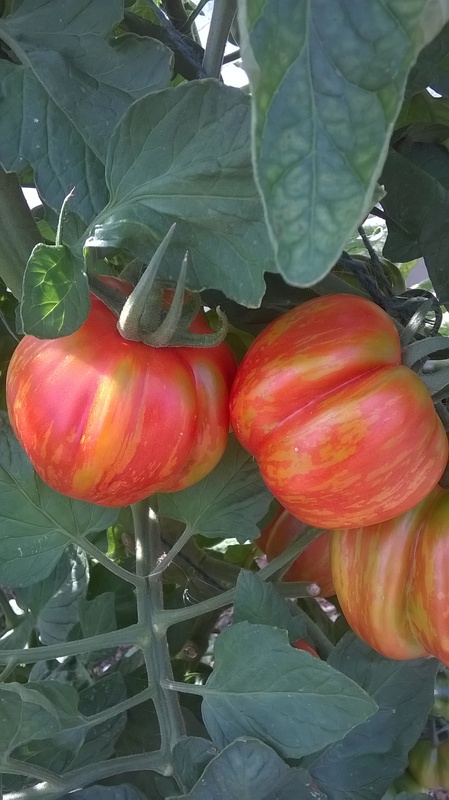 I was very pleasantly surprised by ‘Great White’, they looked spectacular, their flowers were really pretty ‘double’ looking and most importantly the flavour was great, with a really thick and juicy flesh. Not sour at all. Therefore, this year we added ‘Rainbow’s End’, ‘Great White’, ‘Ox Heart’ and ‘Brandywine’. All of these are Heirloom varieties, so we can keep the seed and grow them again, which, at the moment, I would like to do. ‘Brandywine’ has been my favourite so far. A lovely tomato. The best I have ever tasted. Perfect flesh for slicing, huge fruits, juicy with plenty of flavour and excellent on a bit of bread with just salt and pepper (fresh basil doesn’t do it any harm either). You can see from the photo below why supermarkets don’t go for them as they don’t have the traditional “shelf appeal”, though that is quite sad. I can definitely recommend ‘Beefsteak’ and ‘Great White’ and ill update you with information about ‘Mallorquin’, ‘Mortgage Lifter’ and a couple others as we get to them. We are very much enjoying them at the moment. Just looking at them is worthwhile and peoples’ reaction to the size and look is great. They often do not realise that tomatoes have a variety of shape, sizes and colour. Tasting them is the best bit though. I have been meaning to do this for a while, in fact, I have been meaning to update the blog for a while. Not to dwell on what I should and shouldn’t have done, but here is the report I completed examining horticultural therapy practice between the UK and North America. It was funded by the Winston Churchill Memorial Trust. If all works as planned, it should be available to download and read by clicking on the link below, which will open the report as a PDF file.